Strengths Based Parenting doesn't prescribe one "right" way to parent. Instead, author Mary Reckmeyer empowers parents to embrace their individual parenting style by discovering and developing their own -- and their children's -- talents and strengths. 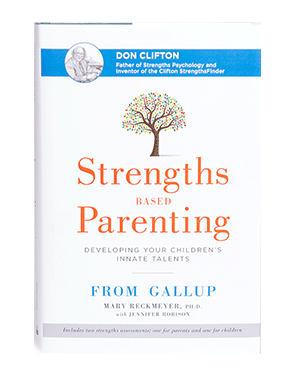 With real-life stories, practical advice backed by Gallup data, and access to the Clifton StrengthsFinder and Clifton Youth StrengthsExplorer assessments, Strengths Based Parenting has the power to change how the world views parenting. Strengths Based Parenting is grounded in decades of Gallup research on strengths psychology -- including assessments of nearly 1 million young people -- and highlighted in Gallup's national bestseller StrengthsFinder 2.0. Gallup knows that focusing on talents and strengths can improve the quality of people's lives. More than 14 million people have taken the Clifton StrengthsFinder assessment to discover their unique combination of talents and strengths. Now, in Strengths Based Parenting, Gallup extends strengths psychology to the most important operating system in the world -- the family. Clifton StrengthsFinder (recommended for parents and children 15 and older): The book includes an access code to take this assessment. Clifton Youth StrengthsExplorer (recommended for children aged 10-14): The book includes an access code to take this assessment. StrengthsSpotting (recommended for children younger than 10): Gallup's model for finding talents in younger children. Once parents identify their children's area of talent and their own, they can start developing them into strengths. To jumpstart this process, the book provides definitions, questions, action items, talent theme contrasts, and clues and snapshots of how a young child may exhibit a particular talent theme. Readers can use this part of the book as a reference after taking the assessments or working on StrengthsSpotting. Raising a child truly takes a village. Strengths Based Parenting can help parents learn how to partner with teachers, coaches and other adults in their kids' lives to create a positive, supportive environment to develop their talents into strengths and instill confidence. "While there isn't a prescription for what each parent and each child must do to have a life well-lived, understanding your own unique constellation of talents as well as your children's gives you a course to chart that fits your parenting, fits your children and fits your family." 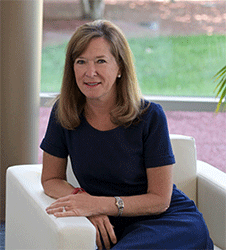 Mary Reckmeyer, Ph.D., is the Executive Director of Gallup's Donald O. Clifton Child Development Center, which has received national attention for excellence in early childhood education and helped parents and children build their lives around strengths. She has studied talent-based interviews of thousands of individuals, including children, teachers and parents, and she helped create the Clifton Youth StrengthsExplorer. Reckmeyer also coauthored How Full Is Your Bucket? For Kids. She and her husband have four children.